The history book explanation of American independence describes a tyrannical king abusing peaceful colonists who eventually picked up pitchforks and firearms and won their freedom. The books don’t always get it right. In Berks County, between Reading and Philadelphia, a different kind of national park shows a side of history that is too important to remain overlooked. Hopewell Furnace National Historic Site is a partially restored factory center where natural resources were harvested, turned into iron and shipped to points in North America, Britain, the European continent and around the world. Industrialists including the Hopewell furnace master were among the first to question their continuing need for Britain. They were the backers of the American Revolution and, for a time, the people who benefited most from it. For hundreds of years, the British economic model was to establish colonies where raw materials could be collected, shipped to England, refined into products and sold back to the colonists at a significant profit for British companies. After 150 years, structural and economic infrastructure in North America had grown stable and mature enough to support international trade without the need for a British middleman. Admission: Free During the September-October apple-picking season, a market-value fee is charged for the fruit. Exhibits and staff are in the visitor center, and programs and demonstrations, self-guided tours and hiking trails are available. Special tips: Much of the furnace site was built on a hillside. Some of the roadways and trails are uneven and some of the historic buildings have steps, but the visitor center and restrooms are accessible for those with mobility issues. Transportation assistance is available in the historic area from spring through autumn. The visitor center movie is captioned, written texts of audio programs can be provided and large-print and Braille brochures and maps are available. Did you know? : Mark Bird never profited from the cannons and other goods he provided to the Continental Army. He struggled to be paid by the bankrupt Continental Congress, and the depression that followed the war strained commerce to the point where he lost his business. Like the Loyalists who fled North America after Britain’s defeat, Bird fled to North Carolina in 1788 to avoid debtor’s prison and died there in 1816. In the 1750s, after much of Gen. Edward Braddock’s army was routed near Fort Duquesne, native tribes raided farms and communities as far east as Carlisle. Wealthy colonial industrialists wondered why they were paying taxes for military protection that wasn’t provided, and why profits from their hard work and ingenuity were being siphoned off to a motherland they felt was no longer needed? Iron production required several resources, all of which were available in southeastern Pennsylvania. Mr. Feil said heavy industry was established in the region early in the colonial period. Iron ore. Iron was discovered early in the region and mines were well-established. Limestone. Raw iron ore contains impurities that must be removed. Limestone, abundant on the surface and easy to collect, is added to molten iron. As it decomposes it reacts with the iron and with the impurities floats to the surface and the slag is skimmed off. Wood. The early furnaces burned charcoal, made by slowly smoldering timber without setting it afire. With liquids in the wood baked out, the charcoal burned much hotter than a bonfire — as hot as 3,000 degrees. Hardwoods burned the best, and southeastern Pennsylvania was covered with thousands of acres of hickory, maple and American chestnut. In a wise form of economic conservation, hardwood trees were cut by hand, and efforts were made to prevent wildlife from slowing the regeneration of another generation of trees. In 20 to 25 years, lumberers returned to harvest more timber. Labor. The word spread through Europe that for the lower classes, the British colonies provided work and a more comfortable lifestyle than they experienced at home. For the educated, skilled and ambitious, fortunes could be made. Immigrants poured into Philadelphia and New York, and some found the nearby Hopewell Furnace. It took only six to eight men to operate the furnace, but many more worked as lumberers, transporters, craftsmen, cooks and retailers who lived on company land. It is believed that a few slaves may have helped to construct the furnace site. A small community of free African Americans and escaped slaves lived nearby in a small community of homes called Sixpenny. The structure of their church, now used as a garage, still stands. Shipping. Iron moved by land or water to Philadelphia shipyards. By 1770, when the furnace was founded, as much as 15 percent of the world’s iron supply came from the American colonies. Furnace master Mark Bird inherited an ironworks from his father and expanded the business with the Hopewell site and other interests. After George Washington’s Colonial Army lost a major battle at Brandywine Creek, Mr. Bird provided supplies during their winter at Valley Forge. Worried that the British might raid the furnace site, cannons made for Washington were buried nearby. As new iron-making technologies emerged, Hopewell Furnace was upgraded and continued to operate through the Civil War. 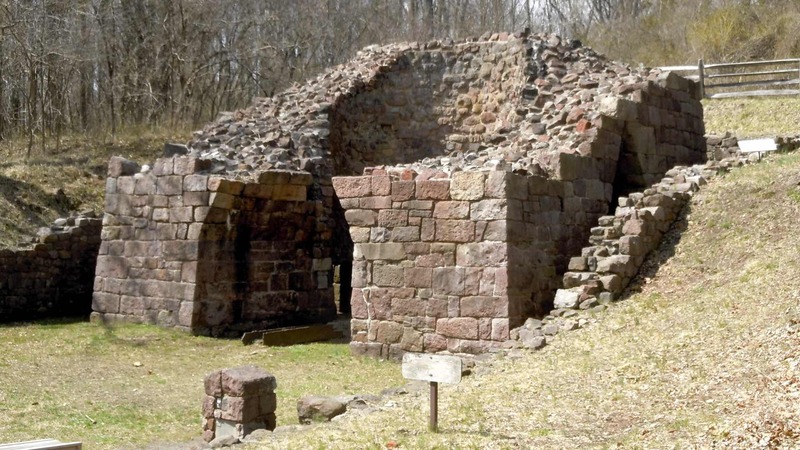 Its works finally obsolete, the fires of Hopewell Furnace were finally snuffed in 1883. Early in the 1930s, when French Creek State Park was established, 848 adjacent acres were set aside to create Hopewell Furnace National Historic Site. As many as 55,000 visitors per year tour the reconstructed worksite, including the visitor’s center, furnace master’s mansion, a water wheel, sluice, remains of an anthracite furnace that operated for just a few years and another dozen restored structures.